Kaffe and I have just stepped off a plane after spending the past seven weeks weaving our way across the USA promoting the latest Patchwork book ‘Quilts in America’. We started our trip in San Francisco at the Vogue Knitting Live Conference. 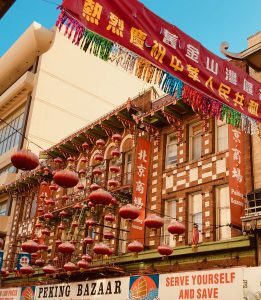 As soon as we had dropped our bags off in the hotel, Kaffe couldn’t wait to walk his old stomping ground and share the visual treats of China town. After passing through the high-end fashion shops, we entered the circus of pillar box red and gold leaf decorations that is China Town. Pattern on pattern and decorated as if preparing for a big celebration, what a welcome sight after a long 11-hour journey. Between classes at Vogue Knitting Live we popped out to drink up every corner of the city, hopping on and off the trolley cars rather than hike the very steep streets. Finding ourselves on the stairs of Telegraph Hill laced in Bougainvillea, banana trees and exotic plants, giving us the most spectacular views of the of the bay bridge. What a city! From San Francisco we shuttled down the coast to Pacific Grove, Big Sur to spend a couple of days with Kaffe’s family at Nepenthe, their family restaurant. Sadly the fog settled in blocking the coastal view they are famed for. 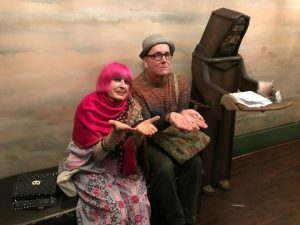 Kaffe had discussions with his niece Erin Gafill, who is an accomplished artist and initiated talks of a joint painting exhibition with Kaffe in 2020 at the Monterey Art Museum, so watch this space for more information as they firm it up. On to Santa Barbara, Montecito, seeing glimpses of the devastation from the recent mud slides, and on to the sleepy surfing community of Carpinteria, staying with friends on the stunning water’s edge of Rincon Point, famed for being a surfer’s paradise. On to Phoenix, Arizona and visiting Taliesin, built by Frank Lloyd Wright, a particularly special place for Kaffe to visit as his family’s restaurant was designed by a Frank Lloyd Wright student. Just time to visit the spectacular Botanical Gardens with the most staggering variety and display of cacti and desert flora. An absolute must see if you can. Denver, Colorado, then to Minneapolis where we had flurries of snow, the charming Mid West town of Lawrence KS, Nashville with its grand houses and funky bars and Tampa Florida, including grateful side trips to Ringling’s Circus and the Art museum in Sarasota, again which we highly recommend. The museum is full of European art, Italianate architecture and a special museum celebrating the Circus told through an exquisite miniature model of performers, animals and parades. Then a quick visit to LaGrange to give a lecture at the Texas Quilt Museum, currently showing a selection of Kaffe’s quilts, staying at Karey Bresenhan’s ranch and making time to visit some of the neighbouring towns such as Roundtop and Fayetteville. If ever you get the chance – do take the trip, it’s like a western movie film set in time gone by but in still functioning towns. It might sound like we were on a ‘busman’s holiday’! All the places we visited hosted a lecture and two workshops with excellent results. They are a lot of work but we both enjoy them no end. 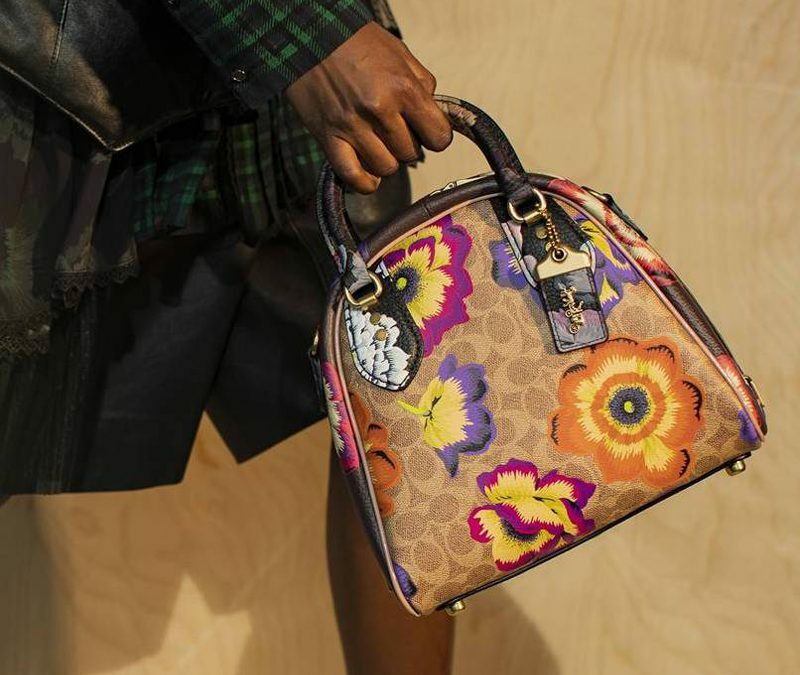 It’s fascinating to see the variety of shops, how people use our fabrics and how well we mix with other labels, gathering invaluable knowledge. But when folk ask do we take a vacation – the occasional visit to somewhere along the way will feed us no end, then we like to get back to the work we love. 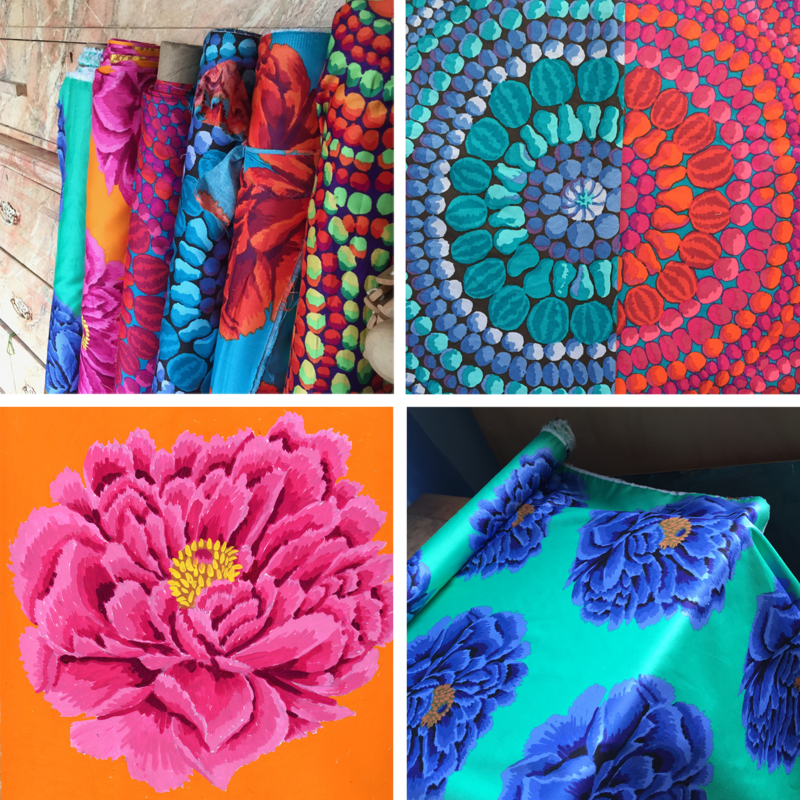 Finally to Houston, 100 miles drive from LaGrange to be reunited with our fellow FreeSpirit design team for the annual gathering at Houston Quilt Market to show off our latest designs including the latest Range of Kaffe’s 108″ wide cotton sateen backing fabric. 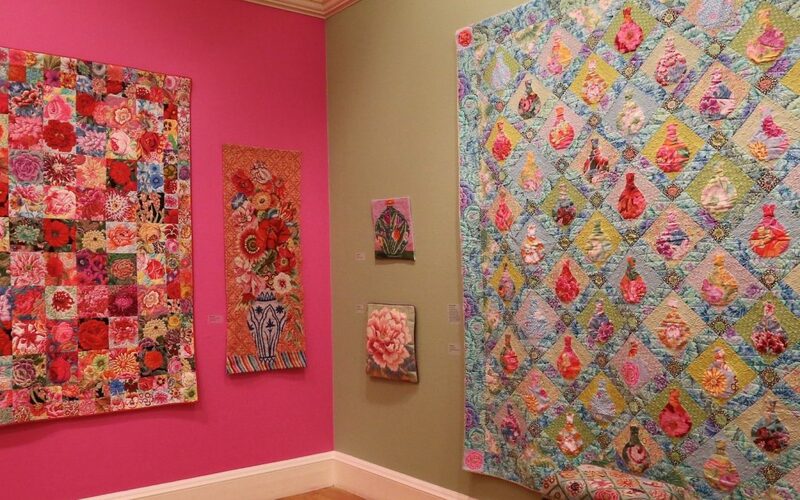 The exhibition hall included a grand show of ‘Quilts in America’ that was a big hit with visitors. There was one quilt causing a lot of excitement called “Mediterranean Tiles” using a mixture of older and some the latest of the Artisan prints and batik fabrics (add Flat Shot). 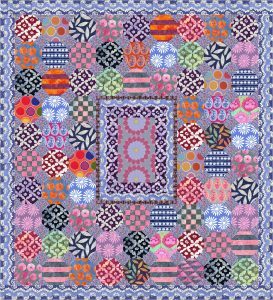 This quilt layout is available as a free download here from ISSU. FreeSpirit Fabrics’ latest catalogue is available online here until they launch their brand new website early in the New Year. 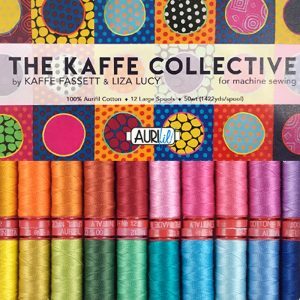 Aurifil, an Italian threads company proudly launched a brand new collection of sewing threads especially chosen by Kaffe and Liza, that our good friend and design partner Liza Lucy has initiated. View the range here. Returning home to London, Kaffe and I were amazed to see how mild the temperatures were and how many golden leaves were still on the trees. I don’t think I’ve seen such beautiful colours in our Fall either. 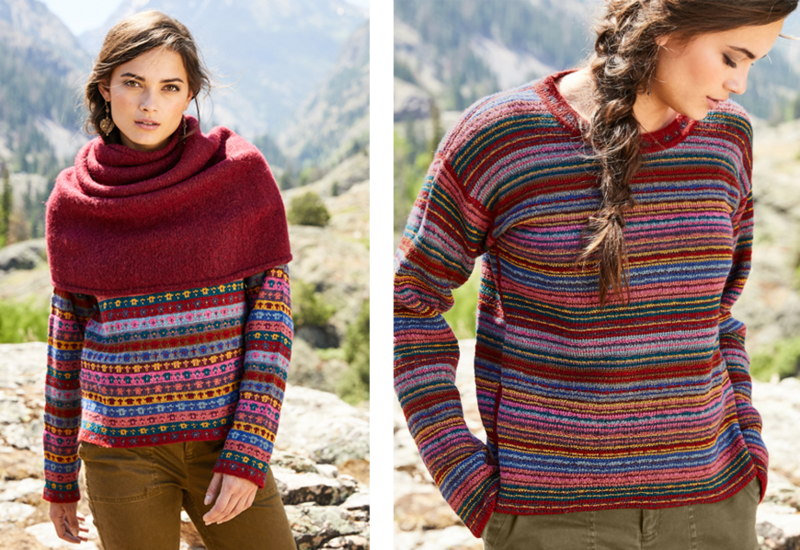 With the seasons changing, Peruvian Connection’s ready to wear, reversible pullover called ‘Megeve‘ appears in their Gift Collection and is available in-store and online along with two others in the current range: the San Marco Pima Cotton Cardigan and the Merano Alpaca and Pima Pullover. 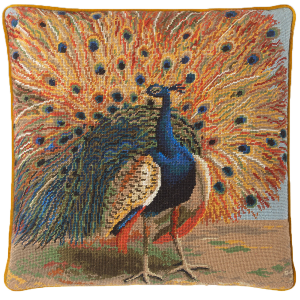 Ehrman Tapestry has announced it has Kaffe’s magnificent Peacock needlepoint kit on sale. Grab it while you can because once it’s out of print it will be very difficult to get hold of. 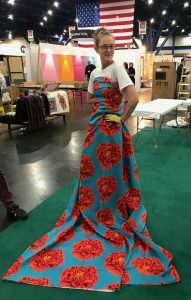 I will be back in Times Square, New York at the Marriot Marquise Hotel for the Vogue Knitting Live Convention mid-January 2019. Join me and a host of other designers from around the world giving classes. More info here. 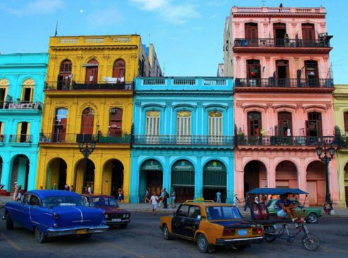 I then hop onto a plane to Kolkata, India to visit a friend for a week. Follow me on Instagram or Facebook under @brandonmably for images I share of all the travels Kaffe and I enjoy. 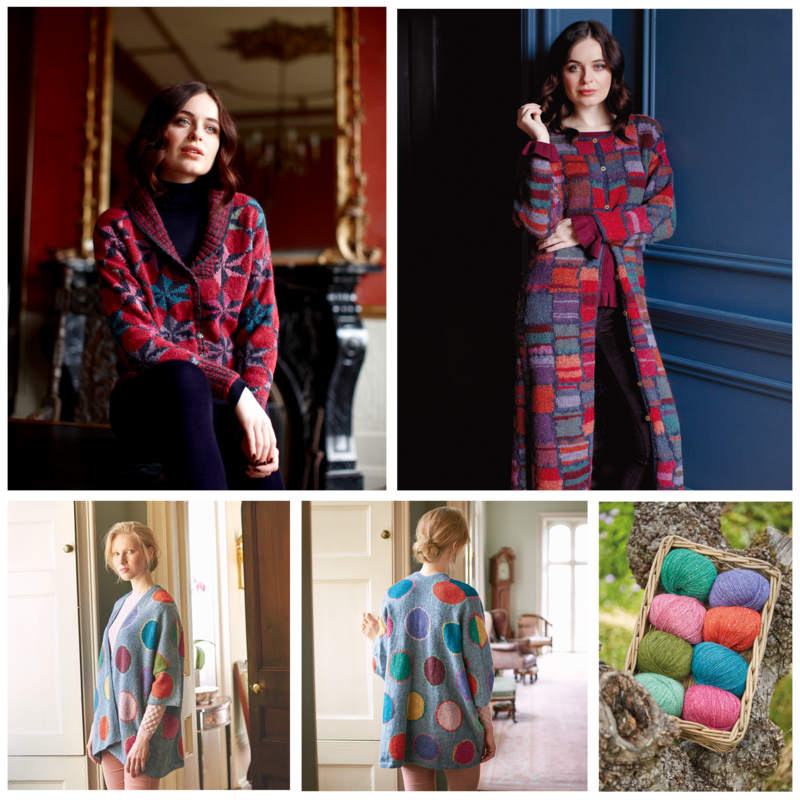 Philip Jacobs’s and my new ranges of fabrics, along with new colourways on some older favourites from Kaffe will be launched in January 2019. We have been playing with higher contrast for a jazzy effect in some of our prints. We hope you enjoy playing with them as much as we have. March 2019 will bring lectures and workshops in Belfast and Dublin. More info on our events page. 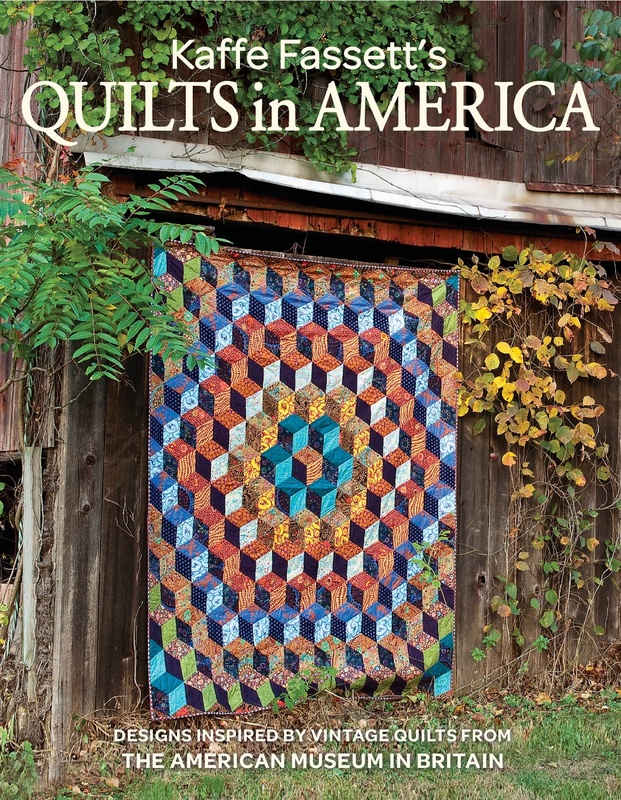 Also in March, The American Museum in Bath will be hosting a six-month exhibition of Kaffe’s quilts from his latest book ‘Quilts In America’, together with the original antique inspiration quilts from the American Museum. The museum will also be hosting lectures and workshops in early May 2019 and late July 2019. Oh, and before we headed off on our US Tour in September, Kaffe had a very special engagement. He was presented with an Honorary MBE (Member of the British Empire) in recognition of his services to the crafts of knitting and needlework. Kaffe’s medal was presented by Michael Ellis MP, Minister for the Arts, Tourism and Heritage on behalf of Her Majesty the Queen. Kaffe’s humble response to receiving the award was that “it is an acknowledgement of all those who work creatively with their hands”. Sending good thoughts to you all as we move through the new seasons.